I’m not much of a chicken fan (unless it’s in soup), let alone the dry, white meat that is chicken breast. I like my meat dark – know what I’m sayin’? The juicy, leggy-thigh, tender bits kind of dark. Was your mind in the gutter? Probably. Mine often is. Anywhozits, you could say I’m a bona fide Italian eater, getting in all the carbs, cheese, veggies, and red meats. So, with this in mind, I’ve made it a personal goal to find ways to enjoy leaner meats like my much disliked chicken breast, hence the one pot chicken dinner. I watch recorded episodes of Chopped all to often, so I was in the mood to go a Middle Eastern route to bring in a few layers of flavor. I made a dry rub out of cumin, cayenne, and coriander, with a touch of pepper. 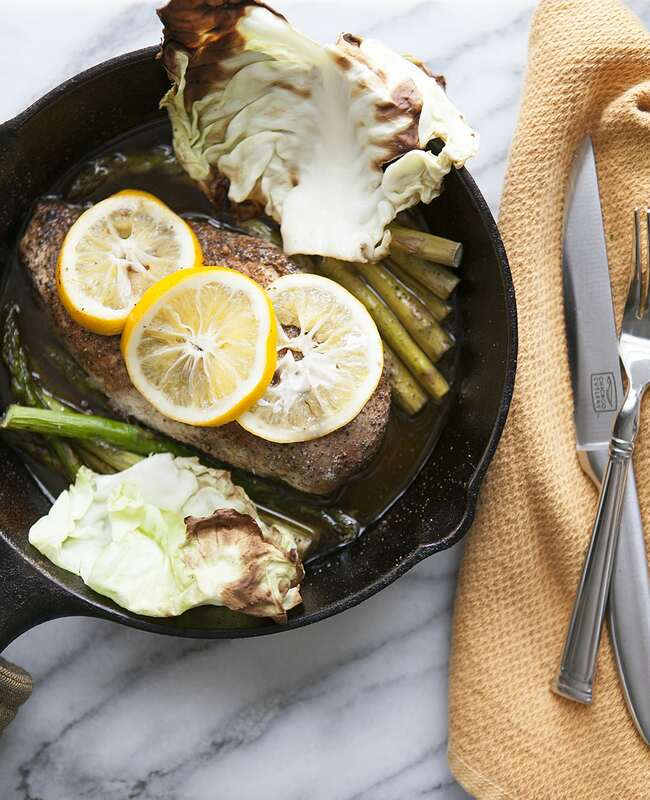 In a 12’’ cast iron skillet, I placed the seasoned chicken, asparagus, cut a few slices of lemon, poured a touch of water into the pan, and covered the pot with a couple of cabbage leaves to lock in moisture. When I uncovered my creation, the chicken darkened up nicely, while retaining the much needed moisture. The cabbage leaves also imparted a nice flavor to the dish. What wasn’t much of a success: I tried to reduce the pan juices to make an au jus. Perhaps the spices made it too oily or it broke cooking down in the pan, but it wasn’t the best thing I’ve ever made. Next time I’ll try cooking for less time or just starting gravy from scratch with chicken broth. No. 1: Preheat oven to 425 degrees. Combine cayenne, cumin, coriander seed, and pepper into a bowl. Rub the dry mixture all over the chicken breast. No. 2: Place chicken breasts, asparagus, smidge of water, and lemon slices into the pan. Cover with cabbage leaves. Roast in the oven for 35 to 45 minutes, or until the internal temperature reads 155 degrees (personal preference, super safe temperature is 165 degrees). Remove from oven and let rest for five to ten minutes. The chicken will resume cooking while resting. No. 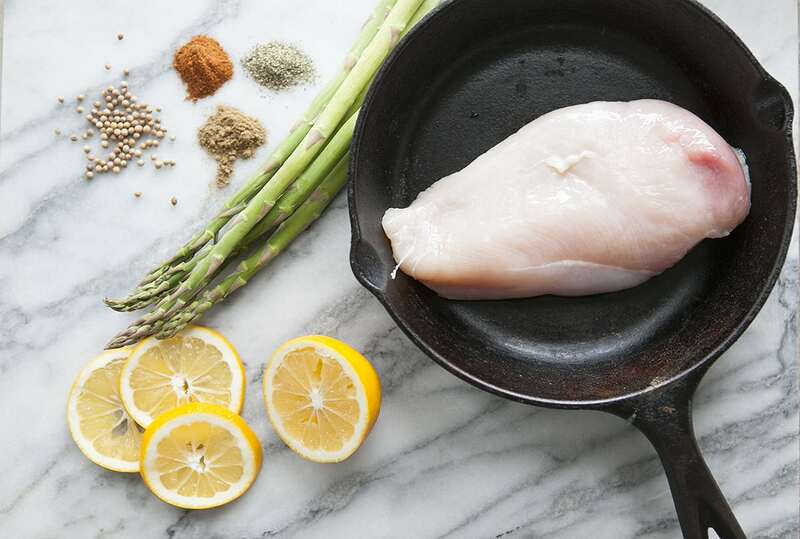 3: Place chicken into a bowl and return cast iron skillet to the stovetop. Reduce the pan juices for five to seven minutes on medium-high heat. Pour sauce into the bowl, cut a few pieces of bread to soak it up, and let’s eat.